After you’ve seen the latest in metal products at METALCON on Oct. 1-3 in Atlanta (stopping by to visit MCA in booth 1553, of course), come see how metal enhances the physical environment of all members of the ecosystem, from people to sea life. 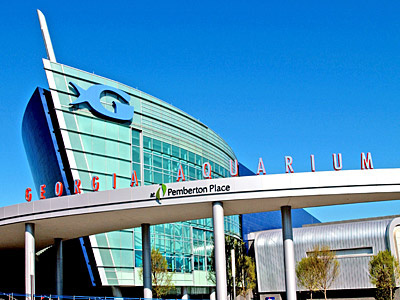 Opened in 2005, the Georgia Aquarium in Atlanta is the world’s largest aquarium. It holds more than 8 million gallons of water and is home to more than 100,000 sea animals. Metal was a key component in bringing this underwater world to life. 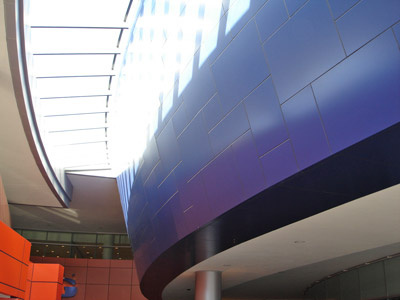 The building’s exterior uses metal panels to recreate the appearance of a ship’s hull. The building uses 50,000 sq. ft. of 3A Composite’s Alucobond metal composite panels. The “ship” features approximately 3,600, 4-mm-thick panels in platinum, silver metallic and custom three-coat blue metallic colors. The aquarium features six regular exhibits—Cold Water Quest, Ocean Voyager, Tropical Diver, Georgia Explorer, Dolphin Tales and River Scout—and a special exhibit, Sea Monsters Revealed: Aquatic Bodies opens September 27. Attend METALCON first and then wade into the metal application of Georgia Aquarium. For more information about METALCON visit www.metalcon.com.